Konark Sprinker Irrigation System confirm to IS 14151 Part 1 and 2. 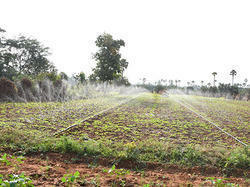 Konark Sprinkler piping system is very popular among farmers in water deficit areas. Complete range of fittings and accessories are well tested before and after assembly. Sizes available: 50mm to 125mm. Specification No. IS: 14151 (Part-II) 1999 of the Bureau of Indian Standards. - Precise application and adjustment of quantity and rate possible. - Low pumping costs, operating at the same pressure as drip irrigation. - Larger wetted zone than with drip irrigation thus plants are less likely to suffer from water stress should there be any delay in irrigation. We are reckoned amongst trusted and topmost company for offering a large range of HDPE Sprinkler System. The HDPE Sprinkler System offered by us is widely known for their corrosion resistance and durability. 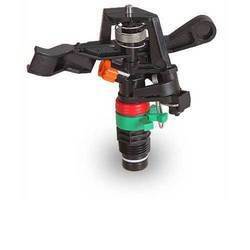 Used for irrigation and many more purposes, this HDPE Sprinkler System is highly demanded in the market. We are introducing an outstanding gamut of HDPE Sprinkler in the leading market. These are manufactured using supreme quality basic material and progressive technology as per international standards at vendors’ end. Furthermore, these products can be availed in different specifications as per the requirement of the client. We have been fulfilling varied demands of our clients with vast range of relevant products including (High-Density Polyethylene) HDPE Sprinkler. It is available at economical price.